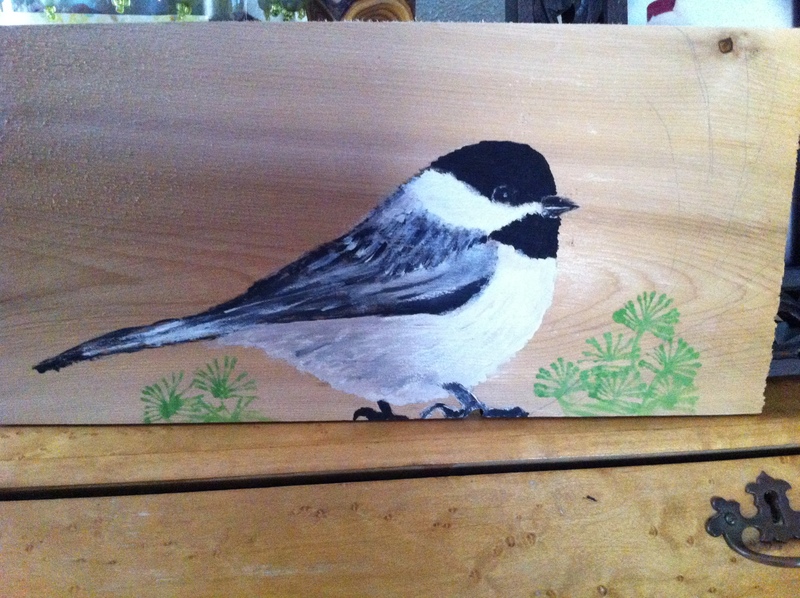 For those unfamiliar with the bird in the above picture, this seemingly benign creature is a Black-Capped Chickadee. They are tiny in stature and extremely friendly once a level of trust has been developed. I would spend countless hours as a child sitting outside on our deck with a handful of sunflowers seeds charming these little creatures to land on my hand. I would marvel at the heat produced by their tiny claws as they gripped my fingers and admire their courage to trust a human feeder. I became much smarter as time went on and removed the actual bird feeder altogether. I was the only source of food for these feathered friends and slowly became the Chickadee Whisperer. These beautiful little birds would jockey for positions on my outstretched hands and graze on the seeds that I willingly provided. More often than not, I would have to leave my perch to fill the supply of food but they were anxiously fluttering around the deck awaiting my return. On one particular occasion, I had gone inside to replenish the supply of seeds and had unwittingly left the screen door wide open. One lone Chickadee flew into the house through the open door and, like a Kamikaze pilot on a suicide mission, thrust itself straight into our living room and landed squarely between the shoulder blades of our long-haired Lhasa Apso, Misty. She had been sound asleep on the couch but the shock of having a foreign object entangled in her fur was immediate and Misty leapt off the couch to shake the intruder loose. The more she shook, the stronger the bird held to her hair. If you’ve ever watched a horse race and really concentrated on the jockey’s hands on the reins and position on the horse – this is what the poor Chickadee looked like riding my dog through the house. I made vain attempts to catch the dog so we could rectify this unsettling but extremely hilarious chain of events but I couldn’t stop laughing long enough to focus on the task at hand. After I finally caught up with the dog there was a great deal of panting. I was panting trying to catch my breath after laughing so hard. The dog was panting because she was probably moments away from having a stroke, and the bird was even panting – perhaps thinking a few more seconds would have garnered that coveted position in the Guinness Book of World Records. With a great deal of wrestling, we finally held the dog still long enough to cut the hair in the death-grip of the birds feet and finally took that poor Chickadee back outside to give it the freedom it so rightly deserved. World record or not, that was one hell of a ride! After this scene, that could only be described as something from a movie, my mother and I both had to change our pants. It will live as one of the most cherished memories of my childhood and I think about that rodeo ride every time a Chickadee graces my feeder. Wow. You’re like Snow White! I suppose your dog was, too, much to his chagrin.